The short films Sur la rive (On the Shore) by Mariama Sy and Derrière les rails (Behind the tracks) by Diedhiou Khady situates the every life of the "little people" in St. Louis, Senegal and in the vicinity of the Guinaw Rail in a suburb of Dakar. Two films that highlight the self-sacrifice of ordinary citizens. 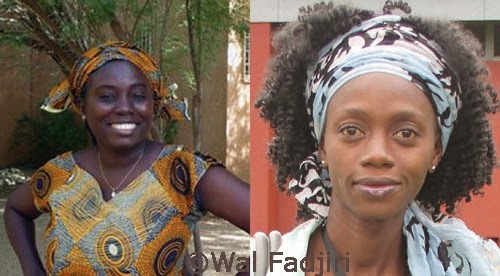 The directors Mariama Sy and Diedhiou Khady were the guests of the fourth edition of the Mois du cinema au féminin in Dakar. Their films Sur la rive and Derrière les rails, respectively, were shown at the Aula Cervantes to a young audience composed of students and those studying cinema and film. The short films share a common theme: the daily lives of the "little people" as the filmmaker Djibril Diop Mambéty would say, where bravery and self-sacrifice seem to be their hallmark. Although with a different décor, the environment in which the characters inhabit in both films is the world of fishing. While Mariama Sy shot Sur la rive in the district of Guet Ndar in Saint Louis, Senegal. Diedhiou Khady set her film Derrière les rails in the vicinity of Guinaw Rail, a suburb of Dakar, presenting the experiences of Dior Leye, a fish merchant. The filmmakers show how these ordinary people manage their daily lives braving the obstacles that confront them from day to day. The fate of the Guets Ndariens is the shortage of fish, which has been the source of their daily earnings for generations. Though ancestral beliefs sometimes help overcome the hardships, it is not a calm life, as it is punctuated by numerous disappearances, because of an uncontrollable sea since the dike in St. Louis was breached. Even if it is not the camera’s target, the highly degraded environment is always in focus. But the film’s most notable drawback is technical. In Sur la rive there is not sufficient lighting. Certain shots are very dark, preventing the faces of the characters to be seen. Was it the screening venue or the film itself? The latter seems more plausible, since in other shots, especially at the end of the film where the fishermen are tallying the day’s revenue, the people are also not visible. These technical problems seem to be shared between the two films. In Khady Diedhiou’s short film, in many of the shots the camera is in constant movement. Even if the names of the directors of cinematography and lighting are present in the credits, there is an absence in the images. With this film, Khady Diedhiou received the UEMOA award for the best documentary film in the last edition of Clap Ivoire in Abidjan in 2014. These are the debut films of the two directors. Les courts métrages Sur la Rive de Mariama Sy et Derrière les rails de Kady Diédhiou fixent le quotidien de "petits gens" à Saint-Louis et à Guinaw rail. Deux films qui mettent en lumière l'abnégation de citoyens ordinaires.